Wrapping your cheese in any type of plastic, whether it be cellophane or bags, prevents it from breathing and builds up too much moisture. Sealing it in plastic alters the protective rind that preserves the cheese, and eventually removes any flavour and texture. Conserve your cheese by covering it in wax paper and aluminium foil. This keeps it from drying out, and allows it to breathe, ensuring that your cheese lasts as long as possible. Once wrapped you should place your cheese in an airtight container, to make sure it gets the right amount of moisture. A plastic container also stops strong cheeses from emitting extreme odour, and shields against pressure and bumps. Soft cheeses, such as Brie and Camembert, will last several weeks if wrapped in wax paper under proper conditions, while firm cheeses, i.e. cheddar and parmesan, thrive inside aluminium foil. Some cheeses are cured for bacteria to develop ammonia. Ammonia is a natural by-product of cheese, but most cheeses develop unpleasant flavours if they never get to release it. Wrapping cheese too tightly prevents it from releasing moisture and breathing out odours that can cause ammonia. 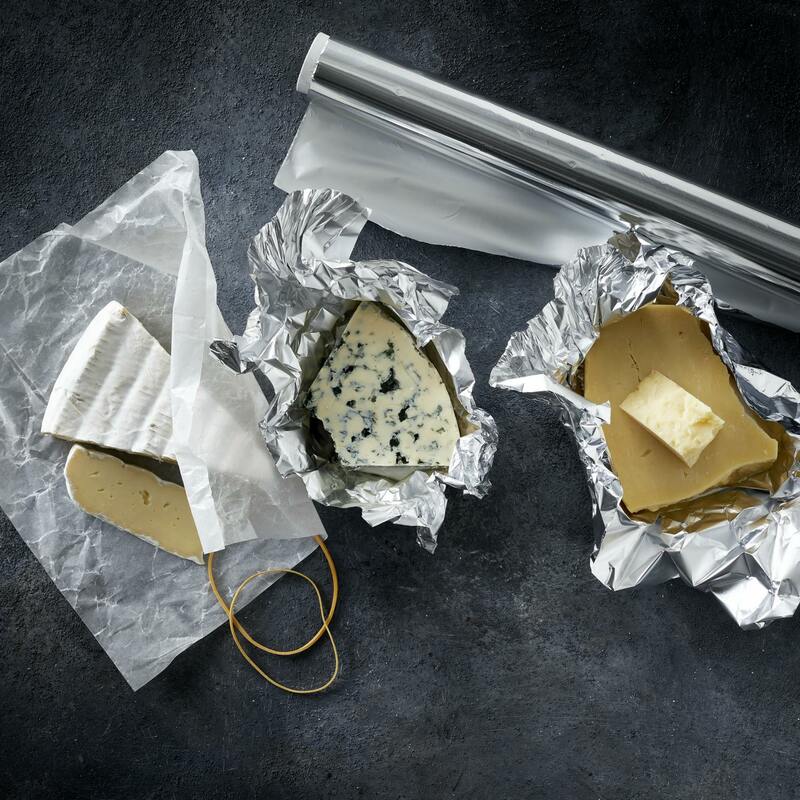 When wrapping your cheese in aluminium foil, you should make sure to leave room for it to breathe. While cutting or serving your cheese, you will unavoidably have to touch the wrapper. Avoid bacteria from your fingers or other foods staining your cheese by replacing the wrapping paper after each use. This maintains the natural balance of humidity in the wrapping and ensures that your cheese stays fresh and flavourful for as long as possible. When storing your cheese, the temperature should be the same as which it was cured at. For most cheeses 5-7°C will keep them fresh for a few weeks, provided they have been properly wrapped. Leaving your cheese in the fridge will decelerate the maturing rate, while warmer conditions allows mould and flavour to develop much quicker. Keep in mind that storing cheese in the refrigerator eventually will dehydrate it, and make it dry out. A much better option would be to store it in the vegetable drawer. Remember to bring out all the nuances in the flavour by removing your cheese from the refrigerator a few hours before serving. You can learn a lot from looking at your cheese. Do not be afraid to touch, smell or inspect your cheese for dryness or any unwanted moisture. If your cheese is feeling unwell, it will be sure to let you know. Look for any cracks that could indicate dry air, and if you smell any odour of ammonia, it could be a sign that it is time to throw your cheese away. Storing your cheese the right way, reduces the risk of your cheese going bad prematurely. If you want to learn a little more about the different types of mould cheeses made by Castello, continue reading! Blue mould cheese has a sharp and distinct taste. The mould is distributed throughout the cheese - both inside and outside. In order for the mould to develop, it requires oxy-gen and therefore in the cheese making the cheeses are pierced with needles to make sure, that the mould can grow. Blue cheeses become more and more biting with age, but if the cheese turns yellow or has an odour of ammonia, you should not eat it. White mould cheese has a mild milky taste. An immature white mould cheese has a firm inside and softness below the rind as it matures from the outside. There are also white mould cheese types that have a very strong and distinct taste. On white mould cheeses, the moulds grow on the surface of the cheese. Red smear cheeses have a rich and aromatic smell and taste. In the cheese making the fresh mould cheese is brushed with red smear culture and as the cheese ages the surface becomes more orange and the taste gets stronger. To fully experience the taste of the cheese, the rind is also to be enjoyed.